Thank you for all who have been posting their photos on our Facebook page. We would love to see what YOU have been knitting from Knitting Pure and Simple patterns. For the month of February, we’re asking fans to share your photos with us on our Facebook page. At the end of the month, the top 3 submissions with photos who have the most likes will each get to choose 3 free patterns from Knitting Pure and Simple. 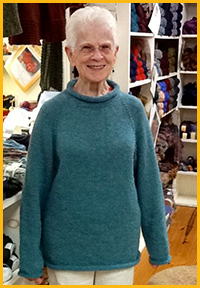 This photo (right) was submitted by Carole, Owner of Orchardside Yarn Shop in Raphine, VA, sporting a beautiful Knitting Pure and Simple roll neck sweater. Win 3 FREE KPS Patterns and submit your photo on Facebook* now. Winners will be announced in March.